Judge Andrew Napolitano returned to Fox News Channel on Wednesday and stood by his report that resulted in President Trump accusing former President Obama of wiretapping Trump Tower. The L.A Times reported last week that Napolitano, a former New Jersey Superior Court Judge who has worked as a commentator on Fox-owned networks for more than a decade, would not appear on the network anytime soon. Nine days later, Napolitano was not only back, but stood by his original report. Earlier this month, Trump tweeted unsubstantiated claims that Obama had illegally wiretapped Trump Tower before last fall’s election. A Senate Intelligence Committee recently declared there is no evidence to support Trump’s claim. During a joint press conference with German Chancellor Angela Merkel on March 17, Trump deflected a question about his tweet accusing Obama of wiretapping Trump Tower by blaming Napolitano’s report. Trump blamed Fox News because Napolitano went on “Fox & Friends” a few weeks ago and said that “three intelligence sources have informed Fox News that President Obama went outside the chain of command” to spy on Trump during last year’s election. 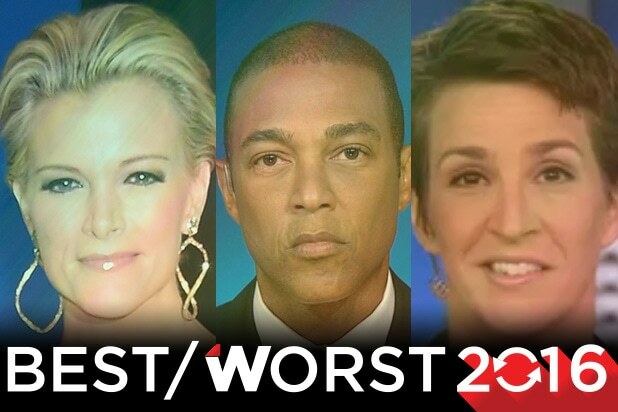 2016 was a wild year for cable news networks, so where did viewers go when they wanted coverage of everything from celebrity deaths to the presidential election? Find out here with the Top 23 shows ranked by rating. Lemon’s primetime show averaged 924,000 viewers and is a unique combination of straight newscast and opinion programming. CNN essentially allows Lemon to do what he thinks will benefit viewers on a nightly basis, which was evident when he recently choked up remembering news legend Gwen Ifill. Burnett continues to be one of the most-watched programs on CNN, averaging 948,000 viewers on a nightly basis. It’s been quite a year for Megyn Kelly and the late-night repeat of “The Kelly File” averages one million viewers per night, topping the live edition of most cable news competitors. Matthews averaged 1.05 million viewers to help MSNBC defeat CNN in the 7 p.m. hour during the wild political year of 2016. Hayes averaged 1.07 million viewers with his unique take on political issues while managing to squeeze in time to grab a drink with TheWrap. Brian Williams returned to primetime after a stint as an afternoon breaking news anchor to average 1.14 million viewers, giving MSNBC a hit show while resurrecting Williams’ career at the same time. Cooper had CNN’s most-watched program of 2016, with 1.14 million viewers. While Cooper is a household name and widely recognized, many will find it odd that he finished behind so many cable news competitors. O’Donnell, who was a writer on “The West Wing” before landing his MSNBC gig, averaged 1.24 million viewers in 2016. The Fox News morning show hosted Steve Doocy, Brian Kilmeade and Ainsley Earhardt averaged 1.27 million viewers. By comparison, cable news rivals “New Day” averaged 508,000 and MSNBC’s “Morning Joe” averaged 677,000. This one is complicated, as “Real Story with Gretchen Carlson” occupied this spot until she filed a sexual harassment lawsuit against former Fox News CEO Roger Ailes, who eventually stepped down in disgrace. Carlson’s old show combined with a variety of replacements averaged 1.35 million viewers. Maddow is the most-watched show that isn’t on Fox News Channel, averaging 1.43 million viewers. 2016 was Maddow’s most-watched year in the show’s history. Jon Scott and Jenna Lee anchor the midday newscast that averaged 1.44 million viewers. Fox News’ Smith cracks the Top 10 by averaging 1.47 million viewers during his afternoon newscast. The afternoon show that features four females and “One Lucky Guy” averaged 1.59 million viewers. Cavuto emerged as a huge fan favorite when viewers realized how much they missed him during an extended absence to recover from heart surgery. He finished the year averaging 1.6 million viewers. Martha MacCallum and Bill Hemmer’s program beat all primetime shows on CNN and MSNBC despite airing from 9-11 a.m. ET. The 7 p.m. ET hour averaged 2.15 million viewers, with “On the Record” and Carlson’s new show combining for the sixth most-watched timeslot of 2016. Sean Hannity’s right-leaning opinion program emerged as must-see TV for Donald Trump supporters and averaged 2.25 million viewers per night. The ensemble cast featuring Eric Bolling, Kimberly Guilfoyle, Greg Gutfeld, Juan Williams and Dana Perino averaged 2.33 million viewers. Bret Baier’s nightly newscast is the most-watched straight news program among cable television with an average viewership of 2.39 million. Megyn Kelly’s star continued to grow in 2016 and the soon-to-be free agent averaged 2.73 million viewers. Fox News Channel’s “The O’Reilly Factor” dominated total viewers in 2016, averaging 3.29 million viewers. If you enjoyed this, check out TheWrap's 16 Media Winners of 2016.